No Civilians on the Battlefield ! (28.02.2010) Optronic Ltd, a German corporation, is recruiting civilians who are to play a part in the U.S. Army’s military training. On German territory, U.S. troops are training for war in Afghanistan. While in Germany, it’s just for training purposes. In Afghanistan, it’s for real. We appeal to the hotel management to no longer tolerate this casting show on their premises. We call on the Optronic corporation to stop recruiting civilians for military training. We protest the degrading use of civilians as bit-players in military training. (28.02.2010) Frank Bärmann: No Civilians on the Battlefield! 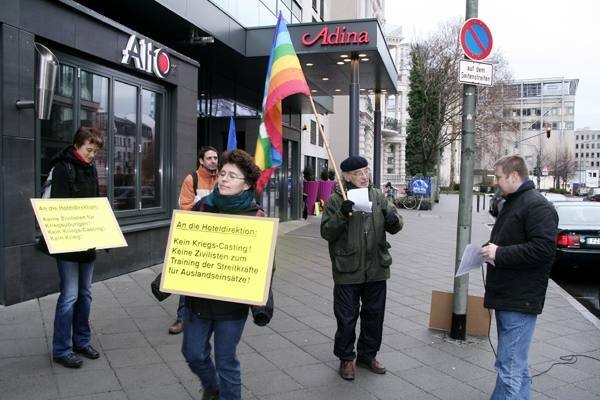 - Speach at the action in Frankfurt/M.